Asian J Agri & Biol. 2018;6(4):543-548. 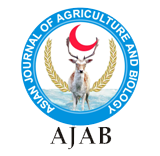 During growing seasons of 2015 and 2016, severe rot symptoms were noticed epidemiologically on root and crown of Triticum aestivum and Aptenia cordifolia seedlings in Kerbala Province, Iraq. Thus, the aims of this research were to isolate, identify and assess pathogenicity of the causal agent of the disease. Several fungal isolates of Fusarium genus were consistently isolated from the diseased root and crown of the seedlings. The pathogen was identified as Fusarium equiseti based on its cultural and morphological characteristics, pathogenicity and sequence of the ITS-rDNA region. This is first record of crown rot disease caused by F. equiseti on T. aestivum and A. cordifolia plants in Iraq.